Lean Six Sigma principles, tools and solutions are best learned through hands-on application, even with the assistance of the most expert instructor. By using MediSim during training courses, healthcare professionals are able to apply these important concepts to a simulated inpatient medication process. Participants practice being change leaders in various scenarios that are designed based on real-world experience in hospitals. Importantly, the simulation is flexible enough to be used in any level of training - Lean Expert, Green Belt or Black Belt. Ready-to-train kit significantly reduces the high cost of developing a custom simulation. Opportunity for healthcare professionals to quickly experience the kind of performance improvements that Lean Six Sigma is capable of producing. Application of both the technical skills and change leadership skills in a simulated environment. Flexibility to use MediSim to reinforce Lean and Six Sigma as an integrated methodology or to teach separately based on organization preferences. MediSim enables instructors to demonstrate and generate interactive dialogues about topics that are essential to developing true Lean Six Sigma practitioners. Our instructors facilitate the simulation during a Lean Six Sigma training delivered for your healthcare facility. You select instructors from your organization to become certified to facilitate MediSim. 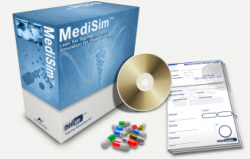 MediSim is available as a three-year unlimited internal use license or for use on a per training basis. Alternative options are available to meet the unique needs of our clients.